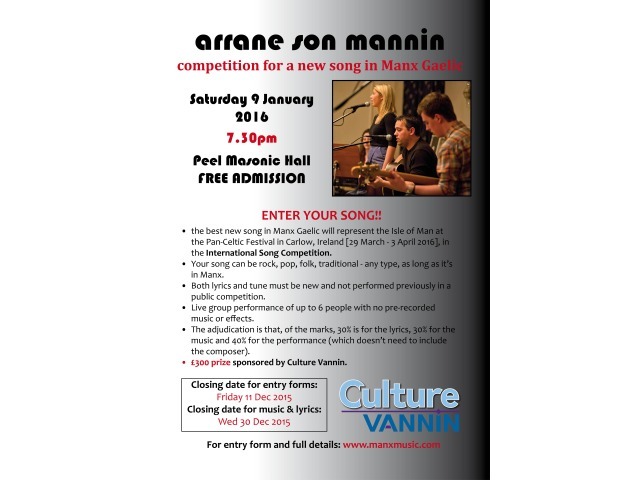 Original songs in Manx Gaelic are sought for the annual Arrane Son Mannin competition. To be in with a chance of winning the £300 prize money (sponsored by Culture Vannin) AND a trip to Carlow in Ireland with your band (up to 6 members) to represent the Isle of Man in the Pan-Celtic Song Contest, send in your entry form to competition organiser Fiona McArdle by 11th December 2015. The entry form for the new song competition, for a newly composed song in Manx Gaelic in any genre is here. Group size must not to exceed 6 persons (unless they agree beforehand to pay their own excess costs if they win). Closing date for the entry form itself is Friday 11th December 2015, with the lyrics in Manx and English, together with the music, to be in by Wednesday 30th December 2015. The adjudication is that, of the marks, 30% is for the lyrics, 30% for the music and 40% for the performance (which doesn't need to include the composer). 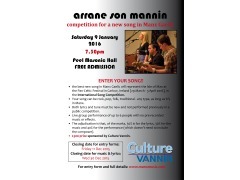 The Arrane son Mannin Song Competition and Concert will be held at the Peel Masonic Hall, Stanley Road on Saturday 9th January 2016, starting at 7.30pm. The winner agrees to take part to represent the Isle of Man in the 2016 Pan-Celtic Festival Inter-Celtic New Song competition in Carlow, Ireland on Thursday 31st March 2016. Expenses, up to a set limit, will be paid.